Hidden is a family drama that unfolds when Jeff Manning gets hit by a car and tragically loses his life on his way home from work. Among family and friends, two women are particularly devastated about Jeff’s death. Claire is Jeff’s wife and she must cope with the loss of her husband while raising their son, Seth. Claire’s older sister, Beth, and Jeff’s older brother, Tim, come to her aid, but this only adds to her confusion because of the past that they share. Five hundred miles away, the woman that Jeff was having an affair with, Tish, feels the same anguish. She must keep her feelings hidden from her husband, Brian, and their daughter, Zoey. When Tish volunteers to go to Jeff’s funeral as a company representative, she steps into Jeff and Claire’s world and the past quickly comes to the surface. Hidden delves into infidelity, regret, and consequences as each character reflects on past events that led them to their present situation. The novel is told from the perspectives of Jeff, Claire, and Tish. The majority of Jeff’s point of view is in the past because the accident that claims his life happens so early in the book. I could never decide whether I liked Jeff’s character or not. He seemed like a good guy outside of his infidelities, but he didn’t seem to really help Claire during her depression. I definitely sympathized with him in terms of his relationship with his brother and felt that their dynamic was intriguing. Claire’s perspective is pretty heartbreaking and seemed authentic throughout the novel. Claire goes through a small tragedy after Seth is born and because of this, Jeff and Claire begin to drift apart. When they finally start to mend their relationship, Jeff is killed and Claire must cope with the loss and then the eventual suspicions of Jeff’s infidelity. I definitely found myself rooting for Claire throughout the novel. I did not like Tish’s character. She has a brilliant daughter and a doting husband, yet because she is bored, she begins to form a relationship with Jeff. She is selfish throughout the novel and I never was able to sympathize with her. Even if the infidelity wasn’t a factor, I don’t think I would have liked her character. I did not like the ending to this book. Beth’s mentality towards infidelity seems twisted and she almost suggests that she would have been fine with her husband cheating on her as long as she didn’t know about it. She tells Claire this to dissuade her from any further investigation into Jeff’s past and I just found it to be a very odd message for the novel to send to the reader. I really didn’t like the epilogue either. Although I didn’t like the ending, I thought that it ended in a good place. Then, after reading the epilogue, I really disliked a couple of the main characters. I really wish the epilogue wasn’t a part of the novel. Although I have never enjoyed reading novels about relationships born out of infidelity, I thought that Hidden was well written. I think that the three alternating perspectives complemented each other well. Aside from the accident that ends Jeff’s life, there really isn’t any action or suspense in this novel. It’s a lot of thinking and recollecting the past, not much present day action. 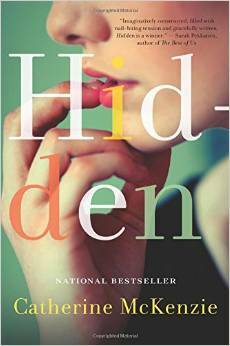 Hidden was a very easy read and I would recommend this to anyone who enjoys a drama and doesn’t mind the infidelity. If you have read Hidden, I would love to hear your thoughts as well. To view Hidden on Amazon, please click here. I received a free copy of Hidden courtesy of NetGalley in exchange for an honest review. This entry was posted in Book Review, Books, Reading and tagged Book Review, Books, Reading on May 5, 2015 by literarychatter.